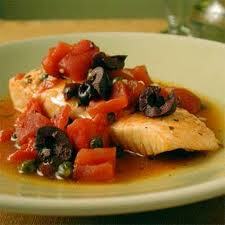 This recipe for poached cod is a little more involved, poaching the fish with onions and tomatoes. Heat the oil in a large, shallow pan and cook the onions until pale golden. Stir in the tomatoes, garlic, olives, sugar, dill, mint, celery leaves and parsley. Pour over the water. Season with salt and pepper, then simmer, uncovered, for 25 minutes, until the liquid has reduced by one-third. Add the cod steaks and cook gently for 10-12 minutes, until the fish is just cooked. Remove from the heat and pour over the lemon juice. Cover and leave to stand for about 20 minutes before serving. Arrange the cod in a dish and spoon the sauce over the top. Garnish with herbs and serve warm or cold.